The Good Place is likely to inspire a few fundamental questions about the afterlife. NBC’s new sitcom stars Kristen Bell as Eleanor, a recently deceased woman who wakes up in a heavenly, Utopian realm overseen by Michael, a charming, divine bureaucrat, played by a bow-tied Ted Danson. But it’s not long before it becomes clear that there’s trouble in paradise—and that trouble’s name is Eleanor. Turns out she doesn’t actually belong in the “Good Place.” Danson and Bell explain what the devil is going on. How does The Good Place not only address the tricky, much-debated topic of the afterlife but base its entire setting there? Danson: In The Good Place, the afterlife is various neighborhoods, each containing about 322 people. Michael is the architect of one of them. [Getting into one of these neighborhoods] is based on a point system where everything you’ve done in life—literally everything: buying a sandwich, reading a newspaper, whatever—has a ripple effect that has an impact out in the world that creates some amount of good or bad. Depending on how many points you’ve accumulated at the end of your life, you either get in or you don’t. 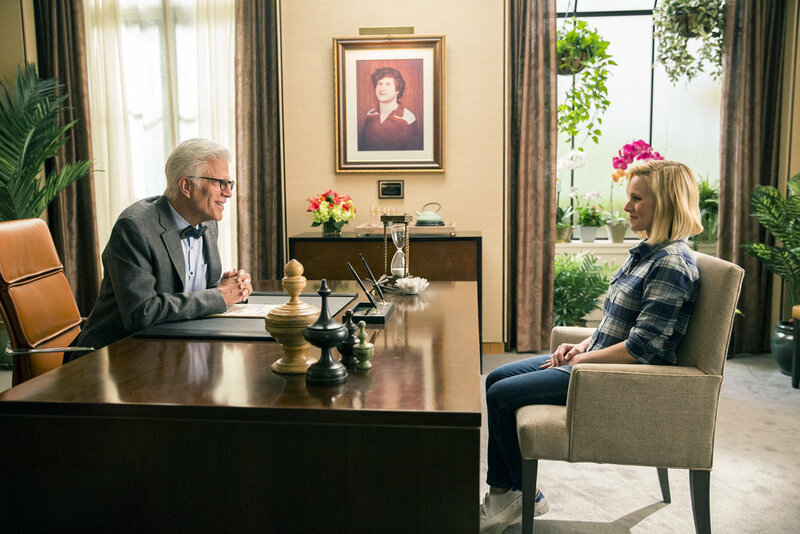 Michael (Ted Danson) tells Elanor (Kristen Bell) that a clerical error sent her to The Good Place. Eleanor is described as an ordinary woman. Does that mean ordinary people don’t get to go to the Good Place? Bell: In [creator] Michael Schur’s mind, it’s very difficult to get into the Good Place. I think his numbers are about one in almost 500 people would get in. So describing Eleanor as “ordinary” is accurate, because she’s not malicious, and she’s not evil. She simply often—if not all the time—puts herself first. And the qualification to get into this world is to be the cream of the crop. These are people who are the most conscientious, the most thoughtful and the most concerned with how their actions affected other people, places and things. That seems like a pretty high bar. Danson: Yeah, but let’s not forget, we’re doing a comedy. So, it’s funnier that way! Michael has designed this perfect place and Eleanor shows up, and she’s basically a clerical error. She doesn’t belong there. To have her be surrounded by the most astoundingly brilliant people is funny, because she was just an average, normal person. The show also sets up most of the “good” people as a little off-putting. They’re benevolent and giving, but they’re not likable. Bell: Being good and being likable are not the same thing. And since at least the pilot episode is Eleanor’s narrative, everybody will seem less likable and better than they necessarily are in comparison to her. Do you think that Eleanor is redeemable—or that she can at least become worthy of living in the Good Place? Bell: I think anybody is redeemable! And I think the simple fact that Eleanor’s quest on this show will be to figure out how to be a good person and put that into practice in order to stay means she’s at least got a chance. Initially, Michael seems like he’s got his act together and everything in his neighborhood under control, but that quickly turns out to not be the case. What’s his deal? Danson: He’s middle management. He’s been an apprentice for hundreds of years and he’s now getting his first chance to design a neighborhood, which is huge. He’s so excited and he loves human beings. He cannot wait to make this the most perfect place. And then when there’s a glitch in the system because of Eleanor, things start to go haywire. It just destroys him. He’s in over his head. When things start to fall apart, he’s all but running around screaming. He’s not the coolest under pressure, and that’s where a lot of the comedy of his character comes from. Elanor (Kristen Bell) talks to one of The Good Place's model residents, Chidi (William Jackson Harper). So do you think you’re most likely going to the Good Place or the Bad Place? Danson: Wow. I have no idea. I guess that’s the wonderful mystery of life. But as far as my life right now, I could not imagine anything better. I’m so blessed, I have an amazing family. I’m married to Mary Steenburgen. I get to work with my great friend Kristen Bell doing a Mike Schur comedy. So, I’d have to say this is kind of heaven on Earth for me. The Good Place, Series Premiere, Monday, September 19, 10/9c; Timeslot Premiere, Thursday, September 22, 8:30/7:30c, NBC.